Steamship by Interocean Steam- ship Corp. from The LTV Cor- poration has been completed. The sale price was $150 mil- lion including $85 million in cash. Tampa, is the original parent company of Lykes Steamship. Steamship will continue to pro- vide the shipping public with the efficient, responsive service it has come to associate with Lykes. "We have enjoyed our associ- ation with the LTV Corporation,"
Mr. Amoss continued. "Our rela- tionship was always a good one. LTV gave us considerable free- dom in both day-to-day opera- tions and long-range develop- ment. As a result of the associ- ation, Lykes is a disciplined, quantitative-oriented organiza- tion. "We are very enthusiastic about Lykes's future," the chief executive officer said. "Because of the sale, we will have the flexibility to devote our resources to vessel replacement and ex- pect to move ahead with the fleet replacement program we already have in a development stage. Steamship has been in service for more than 80 years. Among the innovations it introduced into shipping was the SEABEE barge, container, and heavy lift vessel. Super 12% Cr Steels — An Up- date." Steels" by J.Z. Briggs and T.D. N.Y., have applied for a Title XI guarantee to aid in financing the construction of a 35,000-dwt chemical and product carrier. XI guarantee would cover $80,- 813,000 of the estimated actual cost of $132,219,000. Holland. We have six decades of marine electronics sales and service experience all over the world. Now this same high quality effort is available in most major U.S. ports. Just a single call can arrange for purchase of the most advanced navigation and communication systems available anywhere today. The same call can arrange for service at any location worldwide. Whether you need sales or service you'll get the same courteous attention you'd expect from a company that was in business when your father was at sea. 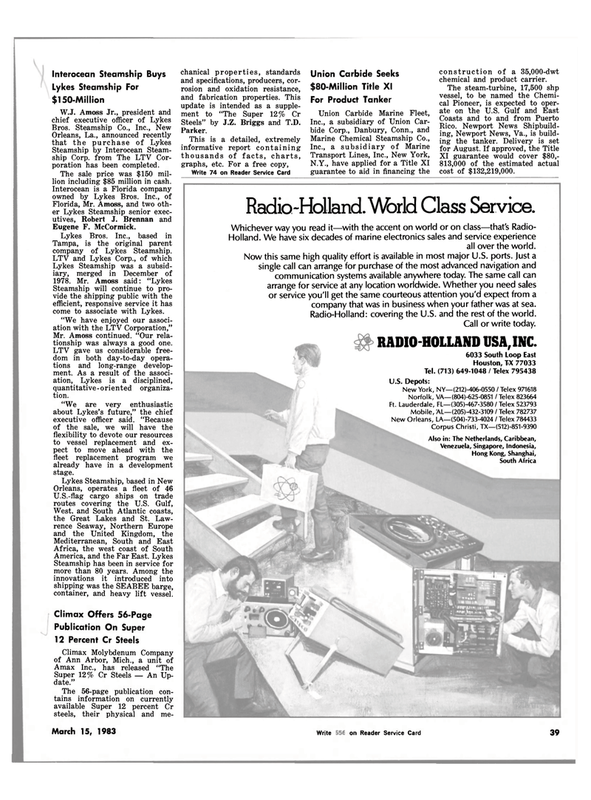 Radio-Holland: covering the U.S. and the rest of the world.